A pressure relief valve (PRV) is a type of safety valve used to control or limit the pressure in a system; pressure might otherwise build up and create a process upset, instrument or equipment failure. The pressure is relieved by allowing the pressurized fluid to flow from an auxiliary passage out of the system. The relief valve is designed or set to open at a predetermined set pressure to protect pressure vessels and other equipment from being subjected to pressures that exceed their design limits. When the set pressure is exceeded, the relief valve becomes the “path of least resistance” as the valve is forced open and a portion of the fluid or gas is diverted through the auxiliary route. The diverted process media is usually routed through a piping system or vented to the atmosphere. Most relief valves used in industrial applications base their relieving capacity on a percentage of overpressure beyond that of the cracking pressure. As seen in our Circle Seal 5100 series flow charts, the relieving capabilities are shown at 10%, 25% and 50% over the valves cracking pressure. These percentages allow the engineer to understand the flow characteristics of the valve at these common intervals. Most applications are designed to have the relief valve relieve overpressure at 10% of the valves cracking pressure, while other applications can allow up to 50% of overpressure to accumulate before it meets the required flow to relieve overpressure. As pressure increases so does the relieving capacity which can either be gradual or instant depending on the seal and set pressure. An example is our Circle Seal 500 series relief valves. When set to a lower cracking pressure such as 25 psi with soft seals, such as Buna N and Viton, they tend to gradually relieve the overpressure in a system. However, our Hoke R6000 series relief valve, which can be set to higher pressures, tend to quickly “pop off” and relieve excess pressure instantly. Standard noncoded relief valves serve their purpose for most of the applications out there. When the application involves boilers or pressure vessels, the most important single safety device is the pressure relief valve (PRV). 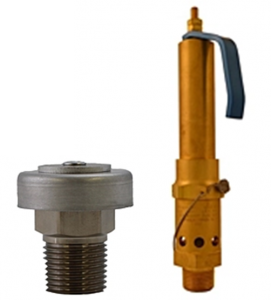 The pressure relief valve is all that stands between overpressure conditions and catastrophic explosions. In most countries, industries are legally required to protect pressure vessels and other equipment by using relief valves. Also, in most countries, equipment design codes such as those provided by the American Society of Mechanical Engineers (ASME) published section VIII Boiler and Pressure Vessel Code establishes safety regulations for boilers and pressure vessels. The VIII section gives detailed requirements for the design, fabrication, testing, and certification for both fired and unfired pressure vessels. It specifically refers to those pressure vessels that operate at pressures, either internal or external, that exceed 15 psig. Valves marked with the ASME stamp MUST achieve a large constant flow rate at no more than 10% overpressure to be ASME rated which ensures the protection of the pressure vessel and downstream equipment. Safety is the number one priority! There is no substitute for an ASME coded valve in an ASME application. Though many of these valves look like their non-coded counterparts, inspectors can easily spot a non-coded valve and can immediately shut down the system until the correct valve is installed. Circle Valve Technologies offers three series of safety relief valves that meet this ASME code, the M5100 series ASME, D500 Series ASME and the Rockwood Swendeman relief valve. These valves are unique, in that they must meet a specific flow requirement at a specific set pressure. Each valve is not only stamped with the ASME logo for visual inspection but also indicate their SCFM flow rate. Commonly found on Industrial and Cryogenic pressure vessels, the Rockwood Swendeman ASME RXSO series relieves quickly all while protecting the pressure vessel and downstream equipment. These are offered in bronze body material as found in the RXSO 710 series or stainless found in the RXSO-S 760 series and can be set from 15 psig to 400 psig. Our Circle Seal line also offers ASME rated valves in the M5100 ASME series and D500 ASME series with an adjustable range of 50-1200 psig for the M5100 series and 15-150 psig for the D500 series. Both series are available in your choice of naval brass or 316 stainless steel body materials and a manual override. Next Next post: Jefferson Solenoid Valves: Don’t Just Go With The Flow – Control It.